Going green is getting a whole new meaning at one Miami-Dade elementary school. On Wednesday, students got to watch their principal take part in a daring challenge that left him at a loss for words when he finally saw what he was getting himself into. The daring stunt was actually a challenge to motivate students. For years, Goulds Elementary School consistently received a "D" grade based on FCAT scores. Two years ago, students turned it around with an "A." That is why the stakes were so high when the test came back around last year. The school wanted to keep the grade. "I was a little nervous because I didn't know what I was going to get on it,” said fifth grader Monteserrat Sanchez. So, principal Raul F. Garcia told his students to simply do their best. "One of the students said ‘would you get a mohawk?’ I was reluctant at first,” Garcia said. But he realized if it would motivate the youngsters, he'd give it a shot. Well guess what? The school grade is back. Goulds got an “A” again. Wednesday, students remembered his word and held him to it. "Mohawk, mohawk, mohawk,” the students chanted at an assembly. Mr. Garcia tried to run away. School cameras caught him hiding in a classroom and then on the playground. He couldn't hide for long. "They found him right in back of stage,” says fifth grader Jalen Houston who laughed in amusement. They found him just in time for the makeover. 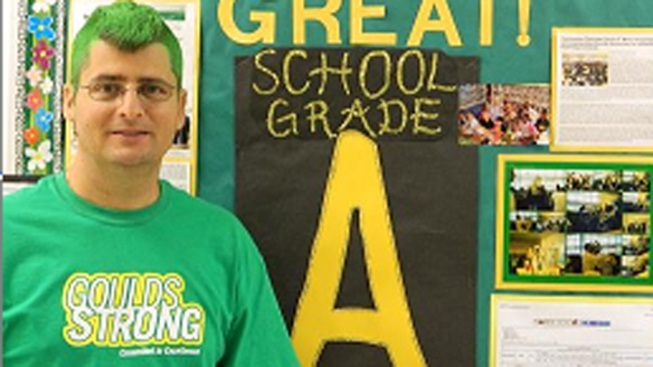 After the haircut, board member Lawrence Feldman added some green highlights in honor of the school's color. "I look like an oompa loompa," Garcia said looking in a mirror. “The promise is I’ll have the haircut throughout the week,” he added. So by honoring his commitment, students are honoring there's to keep pushing. "Next year, I'm going to keep doing the same thing. Try,” Houston said.